MADRID (AP) — Paris Saint-Germain’s hopes of breaking through in European soccer could end earlier than usual this season. A loss against Liverpool on Wednesday in Paris, coupled with a home win by Napoli over Red Star, would keep PSG from making it out of the group stage in the Champions League. And that would be a significant setback for the big-spending French team desperately trying to assert itself as a world-class club. It would be the first time PSG failed to reach the tournament’s knockout round since 2011-12, after Qatar Sports Investments took over the club with the goal of turning it into a top contender. PSG was eliminated in the round of 16 last season, after reaching the quarterfinals four straight years before that. Failure this time would hurt PSG in its second season since signing Brazil star Neymar for 222 million euros from Barcelona in an attempt to increase its chances of succeeding in Europe. PSG enters the crucial match at Parc des Princes with five points in Group C, one behind leaders Liverpool and Napoli. A victory would put the French club back in position to advance depending on its own results. “It’s a decisive match in a very, very complicated group,” PSG coach Thomas Tuchel told French broadcaster TF1. The good news for Tuchel is that Neymar and Kylian Mbappe, who had been sidelined because of injuries, are expected to be available for the home match against Liverpool. Atletico Madrid and Borussia Dortmund lead the group and have a chance to secure places in the knockout round in advance. Dortmund needs a draw at Club Brugge, while Atletico needs a home win against Monaco. Atletico can also advance if Club Brugge loses points against Dortmund, which is coming off a blistering start to the season under new coach Lucien Favre. The only setback for Favre so far was the 2-0 loss at Atletico in the team’s previous Champions League appearance. Paco Alcacer, signed on a permanent basis from Barcelona on Friday, scored again on Saturday in a win over Mainz, taking his league tally to nine goals in seven appearances. Harry Kane kept Tottenham’s Champions League hopes alive with a late double to sink PSV Eindhoven in the last round of games. Now the striker has some back-up as his team tries to complete an unlikely recovery to qualify from Group B.
Tottenham has struggled for attacking fluency this season, mainly because attacking midfielders Christian Eriksen and Dele Alli have been missing at times because of injury. They appear to be fully fit now and were superb in Tottenham’s win over Chelsea in the Premier League on Saturday, a 3-1 win that might have been its best display of the season. Spurs need to beat Inter Milan at Wembley Stadium on Wednesday to keep alive ambitions of a top-two finish. That would leave the teams tied on seven points. Tottenham would still likely require a win at already-qualified Barcelona to advance, given that Inter closes group play at home to last-place PSV. Barcelona, without Rafinha, Luis Suarez and Arthur because of injuries, has a three-point advantage at the top and will clinch first place in the group with a win over PSV, or a draw if Inter does not beat Tottenham. Victories by Liverpool and Napoli would lock up the group which has proven to be the tightest of the Champions League. Napoli, the group’s only unbeaten team with three draws and one win, hosts a Red Star team which still has chances of advancing in its return to the tournament’s group stage after 26 years. The Serbian club has four points, one fewer than Paris Saint-Germain and two fewer than Napoli and Liverpool. Red Star held Napoli to a 0-0 draw at home in the first round, but then conceded 10 goals in losses against PSG (6-1) and Liverpool (4-0). 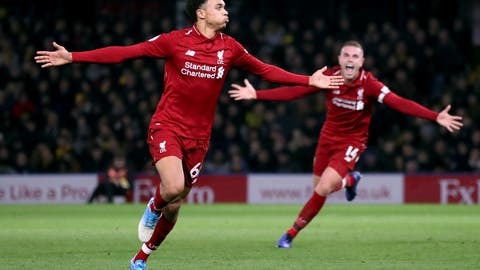 Liverpool, which beat PSG at home, lost 2-0 to Red Star in its previous Champions League match, but it is coming off two straight wins in the Premier League. PSG, cruising in the French league, beat Liverpool 3-0 the only other time the teams met in Paris, nearly two decades ago. Group leader Porto hosts second-place Schalke in a match in which a draw could be enough for both clubs to advance. They would clinch a spot in the knockout stage with a draw if Galatasaray fails to win its match at already eliminated Lokomotiv Moscow. A victory would secure first place for Porto, which has won eight straight entering the match at its Estadio do Dragao. Porto is trying to make it to the round of 16 for the third straight season. The Portuguese champion has 10 points, two more than Schalke and six more than Galatasaray. Porto and Schalke are the only unbeaten teams in the group. Schalke hasn’t made it to the knockout stage since 2014-15.